The most stylish hotel in Corsica, La Villa is a luxury hotel and has a reputation for elegance and sophistication. A truly luxurious and visually stunning hotel, set in eight acres of flourishing gardens bordering the maquis. Jean-Pierre Pinelli, the owner and a man of impeccable taste, has created a sophisticated and elegant hotel with an excellent restaurant attracting attention from miles around. 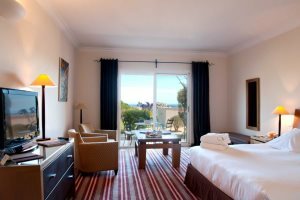 Recently renovated throughout and built in the style of an extensive Roman villa perched high above Calvi, the spacious rooms and terraces offer some of the most spectacular views of Calvi bay and the citadel. 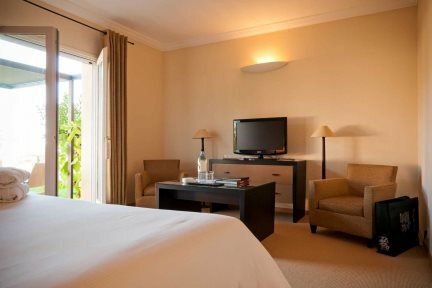 All bedrooms are stylishly designed and luxuriously appointed with comfortable beds and modern en-suite facilities. If you can tear yourself away from one of the four inviting pools and the extensive on-site facilities, an area of Calvi beach with sunloungers, towels and parasols is reserved for all guests. The hotel runs frequent transfers to the beach and the town centre (payable locally), although we recommend you hire a car should you wish to explore Corsica further afield and discover some of its most arresting sights at your own pace. Having been awarded membership of the prestigious group “Relais & Châteaux”, Hôtel la Villa is the perfect choice for couples seeking a luxury experience. "This was the best ever holiday – faultless. We particularly liked the friendly helpful staff, the beautiful pool and the lovely beach." Restaurant 'la Table by la Villa', 'Jo’s bar', three heated outdoor swimming pools, heated indoor spa pool (13m x 3m, max depth 1.55m), poolside bar serving light meals (mid Jun - mid Sep), tennis courts, gym, hammam, beauty salon, internet room, boutique, parking, reserved section of Calvi Beach, shuttle transfers to Calvi Beach and town centre (€18 per room per day or €100 per week), restaurant on Calvi Beach with complimentary sunloungers. Outdoor pool dimensions - Pool 1: 25m x 4.4m, max depth 1.6m, Pool 2: 7.9m x 6m, max depth 1.4m, Pool 3: 8m x 7m max depth 1.5m. 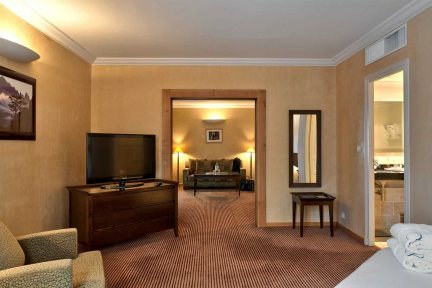 En-suite bathroom and wc (plus separate shower in upgraded rooms), television, telephone, minibar, safe, air-conditioning, Wi-Fi, balcony or terrace. King size bedroom that is 35m² with a balcony or ground floor. The rooms have a view over the sea and the Citadel. Bathroom with bath and separate toilet. 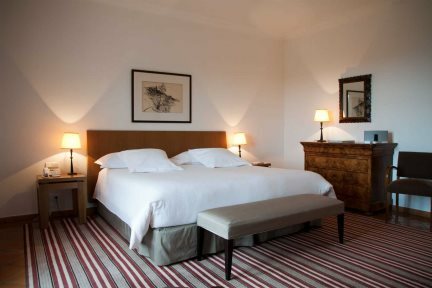 A nice room of 40m² with King size bed (or 2 twins on request) and terrace overlooking the bay of Calvi and its citadel. Bathroom with bath and shower and a separate toilet. 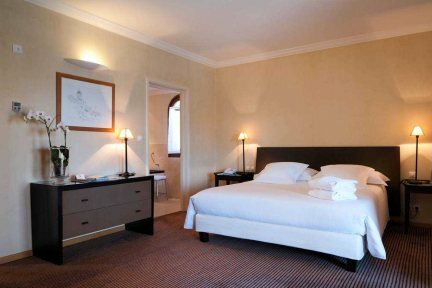 A nice room of 50m² with King size bed and balcony overlooking the bay of Calvi and its citadel. Sitting area, bathroom with bath and shower and a separate toilet. A nice room of 60 sqm with King size bed, living area, bathroom with bath and shower and separate toilet. Balcony with sea view, overlooking the Bay of Calvi and its citadel. 70m² room with 1 bedroom with king size bed and separate living room. Views of the sea and Calvi citadel. Bathroom with bath and shower, and separate toilet.